All our arrangements are shipped in gift packaging, with a care instructions card. To include a gift message card for the recipient, simply mention it in the order notes section when you place your order. Our orders are prepared in 1 to 3 business days, and shipped via USPS Priority Mail, which takes 1 to 3 days. For faster shipping, please select Priority Express as a shipping option and we will do our best to prepare your order in 1 to 2 days. We ship nationwide anywhere in the USA. We do not ship to countries outside the US, except by special arrangement. For more information, please contact us by email. Because every arrangement is handmade to order and contains preserved flowers, we cannot accept returns. All sales are final and no refunds or store credits will be issued. If you have a problem with your order, please contact us by email and we will do our utmost to resolve it. Our roses have been stabilized to last as long as possible, but every home is different and many factors may affect our product’s durability. We cannot guarantee that our arrangements will last without proper care. Over time, depending on the temperature, humidity and lighting conditions, colors may change, and the scent of our Fragrant Rose may fade. For large orders and custom designs, we can deliver locally in the Boston and Metro area. Please contact us by email and we will be happy to help you. We are required by law to collect sales tax on all orders shipped to addresses in the state of Massachusetts. If you are looking for a rose color that you don’t see on our website, please contact us. If we don’t have the color you are looking for on hand, we can create a special order. Special orders require a minimum quantity and can take from 2 to 6 weeks. Exclusively for delivery in the Boston and Metro area, we can create custom designs for events, as well as personalized corporate gifts. Contact us by email for more information. 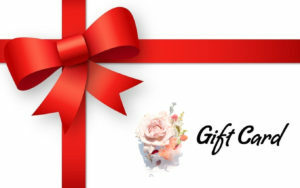 Yes, we offer e-gift cards! They don’t expire and they can be redeemed at our pop-up shop at local markets and events in Boston and metro area. Visit our Facebook page to find out our upcoming markets and events.